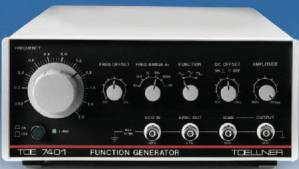 The Toellner TOE 7401 function generator is a universal, general-purpose signal source at affordable cost. Its design concept makes it equally suitable for use in education, servicing, test departments and laboratories. All inputs and outputs are on the front panel and are no-load and short-circuit proof. The generator produces AC voltages with sine, triangle and square signal shapes over a frequency range from 0.2 Hz to 2 MHz. A TTL-compatible output is provided. The function generator can be controlled by an external sweep-frequency control signal fed into the VCO input.